Prime Minister Manmohan Singh’s observation — voiced at the 99th Indian Science Congress at Bhubaneswar on Tuesday — that China has overtaken India in science should not surprise anyone, given the widespread neglect of this area. Apart from poor spending on research and development, which is less than 1 per cent of the GDP and needs to be doubled, there are no incentives for school/college/university students to excel in sciences. It seems Iran is not far away from acquiring the nuclear weapons capability. That is why the US appears to be more worried now than it has ever been. The buzz is that the US wants to paralyse the Iranian economy to force Tehran to abandon its dangerous ambitions. The US has imposed fresh sanctions on the Iranian central bank and financial sector to prevent it from doing oil-related transactions. Elections bring out the best and the worst in our electoral politics. That is why we had the bizarre spectacle this week of BJP leaders in Uttar Pradesh gloating one day for securing a prize catch and being forced to defend the decision the very next day. Babu Singh Kushwaha, a BSP strongman and a close confidante of Mayawati, wanted a political sanctuary after being dropped from the cabinet and denied a BSP ticket. PRIME MINISTER Manmohan Singh's New Year address to the nation was undoubtedly sincere, and certainly meant to be reassuring. His promise “personally” to “work” to provide a "more honest and more effective government" is particularly significant. For, on his own admission, “corruption is now centre-stage”. He could have added that this has been the case since the start of the bygone year when protest against egregious and still expanding graft erupted into the open. THOSE suffering from emotional trauma and traumatic fissures of love in the twilight years of their life can now cheer with the sighting of a lighthouse at the other end of the tunnel. Ostensibly inspired by Claudia Emerson's Pulitzer prize-winning work of poetry, “Late Wife", Natubhai Patel, who recently organised India’s first live-in camp in Ahmadabad for men and women in their 50s, has emerged as an exploratory scout with a mission. As the average life expectancy goes on rising so does the number of persons living beyond their sixties. Today, the life expectancy in India has increased up to 66.8 years but is still less than in developed nations. In medical terminology, usually a person above 65 years is termed as ‘elderly’. Today ‘geriatrics’ — the field of medicine that deals exclusively with elderly patients — is flourishing in developed countries. Countries like ours are also actively engaged in establishing geriatric clinics in tertiary-level hospitals. Prime Minister Manmohan Singh’s observation — voiced at the 99th Indian Science Congress at Bhubaneswar on Tuesday — that China has overtaken India in science should not surprise anyone, given the widespread neglect of this area. Apart from poor spending on research and development, which is less than 1 per cent of the GDP and needs to be doubled, there are no incentives for school/college/university students to excel in sciences. Educational institutions in general and those in the rural areas in particular lack the infrastructure necessary for the pursuit of science. There are no role models to motivate students. As society values commercial success more than academic excellence, IITs have emerged as the most sought-after academic destinations for students. IIT graduates and MBAs are offered jobs with fat salaries, which make newspaper headlines. Scientists, technologists, doctors, agronomists and the like work hard quietly in their chosen field, retire and then die unsung. Barring those who join private firms or hospitals, they lead a modest life. We as a country do not value science and do not respect our scientists. The best of the scientists and doctors have to work under some IAS officer or an ill-qualified minister. Even when it comes to issues where scientists should have the last word, the generalists brush their opinion aside. Take the case of Bt brinjal. A panel of scientists had cleared it for cultivation but the minister concerned opened the issue to public debate. Social activists resorted to street protests, putting the years of hard work and field trials in cold storage. Bt cotton, fortunately, was spared and has benefited farmers immensely. India needs to push up food production and power generation to meet the needs of a growing population. But nuclear energy evokes strong emotions among certain people. It is not enough to allocate more funds and rope in private firms to boost research in sciences. The mindset that distrusts scientists needs to change. Indians by and large have not yet developed a scientific temper. It seems Iran is not far away from acquiring the nuclear weapons capability. That is why the US appears to be more worried now than it has ever been. The buzz is that the US wants to paralyse the Iranian economy to force Tehran to abandon its dangerous ambitions. The US has imposed fresh sanctions on the Iranian central bank and financial sector to prevent it from doing oil-related transactions. The sanctions will also be applicable in the case of the countries that refuse to snap their trade relations with Iran. Russia and China, which have close economic relations with Iran, may be among the other affected countries if no corrective measures are taken. This may complicate the situation, leading to unimaginable consequences. Iran is showing no signs of being scared of the US action. Instead, it has warned the US to keep off the strategically significant Strait of Hormuz through which one-fifth of the world’s oil supply passes. The US navy’s biggest aircraft carrier is about to enter the Strait of Hormuz as a matter of routine. Iran claims that it has the right to block the shipping channel and it will do so as its response to the latest US action to reduce Tehran’s earnings through oil exports considerably. The showdown, which appears imminent, between the US and Iran may lead to an acute oil shortage, resulting in a fresh rise in energy prices. The situation may become more complex with the European Union also threatening to announce an embargo on importing oil from Iran. All this is happening over six weeks after the International Atomic Energy Agency issued its latest report saying that Iran may be working secretly over a nuclear warhead design despite its denials to the contrary. Since then the US has been under tremendous pressure from its West Asian allies like Saudi Arabia to prevent Iran from acquiring nuclear weapons which will upset the power balance in the region. The Saudis may help the US scheme of things by increasing their oil production to keep its prices at the desired level. The Iranians seem to be ready for a military conflict with the US. Can the US afford it when its economy is finding it difficult to come out of the recessionary quagmire? Elections bring out the best and the worst in our electoral politics. That is why we had the bizarre spectacle this week of BJP leaders in Uttar Pradesh gloating one day for securing a prize catch and being forced to defend the decision the very next day. Babu Singh Kushwaha, a BSP strongman and a close confidante of Mayawati, wanted a political sanctuary after being dropped from the cabinet and denied a BSP ticket. For the BJP, which prides itself for being a ‘party with a difference’ and has occupied the moral high ground on issues related to corruption, it was an unusual move to induct Kushwaha, who was already under a cloud and had been indicted by the Lokayukta. Indeed, the temptation to induct the strongman turned out to be irresistible for BJP leaders. They, however, found themselves with their back to the wall the very next day, when the CBI filed fresh cases against Kushwaha in the ‘Rural Health Mission’ scam and raided 60 places in the state, including his houses. The political fallout has made dents in the carefully cultivated image of the BJP as a party in the forefront of anti-corruption crusades. The party’s laboured explanation that it holds no brief for Kushwaha and that it would not defend him, were he to be found guilty, glosses over the party’s compulsion to induct him in the first place, and that too barely weeks before the assembly election. The BJP has inducted not just Kushwaha but two other ministers discarded by Mayawati, prompted no doubt by their ability to mobilise money, muscle and manpower. The prospect of Kushwaha bringing in OBC votes would also have been a motivating factor. With as many as 60 seats in the Rajya Sabha falling vacant in April this year, the stakes in Uttar Pradesh and the four other states going to the polls are obviously even higher. The electoral results in the five states can potentially change the complexion of politics in Parliament and also set the stage for the next general election. Political parties, therefore, are unlikely to stick to moral high horses. They are far more likely to gloss over niceties and do everything in their power to win. PRIME MINISTER Manmohan Singh's New Year address to the nation was undoubtedly sincere, and certainly meant to be reassuring. His promise “personally” to “work” to provide a "more honest and more effective government" is particularly significant. For, on his own admission, “corruption is now centre-stage”. He could have added that this has been the case since the start of the bygone year when protest against egregious and still expanding graft erupted into the open. Dr. Singh is a man whose personal integrity has never been questioned even by his worst critics. However, even his best friends do regret that there was unconscionable delay in taking action on 2G and CWG mega scams.This should explain why 2011 became, up to a point, the Anna Year. Dr. Singh's description of his government's inability to see the Lokpal Bill through the Rajya Sabha as “unfortunate” was the understatement of the century. It reminded me of the late 1980s when the first case of “sati” took place in Rajasthan. V. P. Singh, then the Opposition's rallying point and already believed to be the putative Prime Minister, used exactly the same utterly inadequate expression about what he called “the incident”. The then Prime Minister, Rajiv Gandhi, waited three weeks before deploring the outrage. What happened in the Rajya Sabha at the midnight hour on December 29 was not just unfortunate; it was a squalid and unspeakable episode that has done lasting damage to both the fight against corruption and parliamentary traditions in this country, such as they are. It is also typical of Indian polity that both sides — the Congress and the BJP — are engaged in the usual war of words, blaming each other for the Lokpal Bill fiasco over which everyone ought to hang their head in shame. Looked at objectively, the bulk of the blame for the disgraceful event belongs to the Congress that is in the driving seat. Reluctant to face a vote even in the Lok Sabha, where it has a simple majority, it was scared of voting on the Bill in the Upper House, where it knows it is in a minority. So, it concocted the disgusting plot to create, with the abetment of Lalu Prasad Yadav's mini-party, a ruckus inside the House. So transparent was the Congress trickery that the electronic media, during its non-stop coverage, telecast all the plot's gory details well in advance. Moreover, it was not the BJP but the Congress's “key ally”, the West Bengal Chief Minister and the supreme leader of the Trinamool Congress that sealed the Lokpal Bill’s fate. This said, one must add, in all fairness, that during the sordid drama the parties arrayed against the Congress were not lilywhite innocents. The same media that scooped the Congress's script of dirty tricks, also reported that every party or formation was following a dual, indeed duplicitous, policy of pretending to support the Bill but wanting to abort it, and let the ruling alliance carry the can. If the Prime Minister does not want last year’s blunders to be repeated during 2012, then he has an arduous task on his hands. He has to see to it that the glaring distortions in the system that have made it dysfunctional and indeed paralysed it are set right without delay. To begin with, coalitions in India have been unavoidable for nearly two decades and are likely to remain so for the foreseeable future. But coalition culture is conspicuous by its sheer absence. Even Atal Bihari Vajpayee who managed a motley crowd of 24 parties relatively better had to “roll back” many of his government's decisions under pressure from his wayward allies. The Congress' record in this respect has been a lot worse principally because of a hangover of the era when it ruled at the Centre and in most states entirely on its own. Arrogantly, it does not bother to consult its allies before taking and announcing controversial decisions of great import. Its leadership remains unaware of the major shift of power to the states. The list of issues on which Mamata-di has checkmated the Union government is long and impressive. Relations between the Congress and another important ally, Sharad Pawar of the Nationalist Congress Party, have been uneasy at best and appalling at worst. The forthcoming assembly elections in the politically vital state of Uttar Pradesh, on which the Congress heir apparent, Rahul Gandhi, seems to have staked his political career, has added to the delicacy of the Congress’s relationship with parties like Mulayam Singh Yadav’s Samajwadi Party or Mayawati's Bahujan Samaj Party that have come to the aid of the ruling party in times of acute difficulties, obviously for a consideration. Secondly, if the country mired in a massive mess that is both political and economic has to be rescued, its rulers have to provide decisive and firm leadership of which there has been little sign so far. The Congress is most unlikely to have another Indira Gandhi. Nor is the BJP likely to be led by another Vajpayee. So, those bearing the responsibility must rise to the occasion as best they can. The Prime Minister is the leader of the government and must behave like one. It does not behove him to sit silently in the Rajya Sabha while his junior ministers worsen the prevailing turmoil. A bigger problem is the total failure of the diarchy in which the Congress president has the power without responsibility and the Prime Minister responsibility without power. Not to mend or end this state of affairs would spell disaster. A brief word must be said about Anna Hazare and his movement. First, the issue of having a “strong Lokpal” would never have assumed the importance it did but for Anna’s crusade against corruption. He did generate huge pressure on the government. Secondly, Mr. Hazare has overreached himself and some members of Team Anna have compromised themselves and yet claim monopoly on probity. The anti-climax came at Mumbai while the government was writhing in discomfort in Delhi. Dr. Singh did announce some other of his crucial New Year resolutions during his address to the nation. But these would have to be discussed separately, except to say that he and his government will be judged by the results they produce, not by the claims or promises they make. Such was the gusto that 70-odd females, wrapped in style and glamour, descended to choose a sheet-anchor for the second innings, rattled by the loss of their spouse. Apparent believers in the French maxim, “Forty is the old age of youth; fifty is the youth of old age”, all the 320 male enthusiasts, roving for a new companion, were jostling to travel extra miles, before fading into the sunset. Echoing Carl Auerbach’s buzz, “You’re only 43, not too old to start again; thank God you never gave in and had kids”, in “Goddess of Remarriage”, the platonic Samaritan reverentially enthroned the newly-evolved deity in the sanctum sanctorum of their heart, deserted by her Greek predecessor, Cupid. It is usually not unusual that the celebrities generally defer their marriage till they succeed like success, and the girls justifiably, therefore, start viewing them as sugar daddies. There are several like the Irish poet, WB Yeats, who married at 50, or England’s national poet, Philip Larkin, who sailed on three live-in relationships, or Nawab Saif consistently dating Kareena or Salman persistently mating many without marital assurance or Shashi Tharoor who cocktailed Sunanda into cricket before padding in life. Last Sunday, “when on my couch” I lay to retire, the philosophical resemblance between real life and a cricket Test match came cascading “upon my inward eye”. Human life could also be equally entertaining or monotonous, I pondered. The composition of team members, their mutual chemistry and skill to encounter a bounce are crucial for roaring performance, both in real life and on the field. When a bride and a bridegroom, in their maiden innings, hook each other for a six, all the friends tear the sky apart; and, likewise, when Sachin and Sehwag weave double hundreds, the spectators tremor the pavilion into collapsing. The watchful openers bat in tandem and build partnership. Similarly, the husband-wife duo also negotiates the bouncy track and creates an emotional igloo to thrive. But, alas, soon descends there a pall of gloom, when a life-partner bids adieu or a well-set cricketer departs. Instantly, rules there the silence of the graveyard. As the shadows start lengthening; behold, silently walks in a night watchman, to join the survivor to manoeuvre the turbulence. Similarly, in real life, two solitary reapers team up to harvest the fluctuating vicissitudes. Interestingly, women tend to delay remarriage, delighting in newfound freedom while men rush to bat again. However, one should be watchful before opting for a second ride. The night watchman must be the one who can redraw the erased contours of a soul-mate and lend continuity. Certainly, like Eknath Solkar, who made the only century of his Test career, donning as a night watchman. Elderly patients tend to develop dementia, hearing and/or vision problems, which can cause problems in taking the right dose of their medicines or not remembering how and when to take the drugs. Moreover, they may not remember or misunderstand verbal instructions of doctors. This may lead to poor compliance resulting in poor disease control. As per a UN initiative of 1999, all nations should prepare their healthcare, social, and economic systems for recent and future demographic ageing of their population. To date there is no current national formulary, guiding drug therapy for elderly patients in our country. PIM as defined by Beers criteria comprises “drugs that pose more risks than benefits to the patient. The risks of using these medicines range from minor weakness to orthostatic hypotension, prolonged sedation, falls and fractures, or even life-threatening events. Elderly patients are about three times at risk of developing adverse drug reactions (ADRs) than normal adults of 30-40 yrs. Prescribers must be alert to fact that newly developed signs and symptoms may be due to the adverse effect of a medicine and not necessarily a new disorder. The vicious cycle of prescribing medicines to treat new symptoms leading to more adverse effects of the newly prescribed medicines must be recognised and sorted out early. As a general caution, “start low and go slow” for these vulnerable senior citizens. Try to use as few medicines as possible in the elderly. As the human body ages, there is a reduction in the normal physiological functioning of vital organs — kidneys, liver, heart, brain and lungs etc. This has an effect on how the body handles medicines or drugs. As kidneys and liver are the major organs, which help in the metabolism and elimination of medicines from the body, elderly patients may be exposed to higher concentration of these medicines, thereby increasing the chances of harmful effects of medicine, even when prescribed in usual adult dose. Elderly patients are also more ‘sensitive’ to actions of many medicines, which can lead to their body’s exaggerated response to medicines, causing more side-effects than anticipated. For example, the sleep-inducing and anxiety-relieving medicines can impair the normal posture-control mechanisms, which may lead to falls and fractures. Moreover, elderly patients are usually on many medicines for diseases, which occur with ageing, for example diabetes, hypertension, heart disease. Also they may suffer from joint pains (due to osteoarthritis), memory problems (dementia), unable to get good sleep (insomnia), cataract, varying levels of hearing loss, gastrointestinal problems like indigestion and constipation. There can be osteoporosis, especially in females, and enlargement of the prostate gland in males leading to urinary problems. This situation is a double whammy for the elderly — their bodily functions gradually decline, while the number of medicines prescribed to them increases. This creates a situation where this group of senior citizens becomes vulnerable to harmful effects of medicines (adverse drug reactions or ADRs). Since most elderly patients are often on multiple medicines for more than one ailment, there is also a risk of drug-drug interactions and drug-disease interactions, which may be harmful to patients. The problem of poly-pharmacy, prescribing more than seven or at times, 10 medicines, is specially more severe in hospitalised elderly patients, and is a major cause of medicine errors posing risk to the patient’s safety. This may not hold true for all elderly patients taking various medicines but it is more likely to happen in that age group than in young or middle-aged persons. It has been seen that the use of safer medicines as substitutes can reduce the chances of potential harm from these medicines. Few of the commonly used medicines in Beers PIM list, which are available in India, and which could pose increased risk, if prescribed to elderly patients, are described here: Out of all non-steroidal anti-inflammatory drugs (NSAIDS), indomethacin (is a strong painkiller, causes some effects in the central nervous system (CNS); doxepin (is used in psychiatric disorders, is a strong anti-cholinergic drug and has sedating properties); disopyramide (is an anti-arrhythmic agent, it is the most potent negative inotrope, and may induce heart failure in elderly patients. 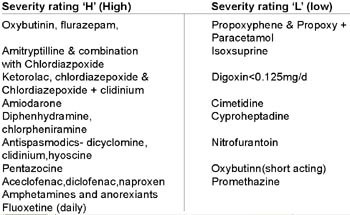 It is also strongly anti-cholinergic drug); ticlopidine (is a platelet-inhibiting agent, though no better than aspirin); cyclandelate (is an older neuro-protectant but lacks efficacy); doxazocin, clonidine, short-acting nifedipine (anti-hypertensives, potential for hypotension, dry mouth and constipation); chlorzoxazone (a muscle relaxant, poorly tolerated in elderly, effectiveness doubtful); thioridazine, amitryptilline, ergotamine, diphenhydramine, chlorpheniramine and ferrous sulphate in doses greater than 325mg/day. Besides these, some other commonly used medicines to relieve pain and swelling — naproxen, piroxicam and ketorolac; sleep-inducing and anti-anxiety agents like diazepam, flurazepam, chlordiazepoxide; anti-spasmodics like oxybutynin, dicyclomine and clidinium can pose risk to the patients and should be substituted for safer medicines. For elderly patients, who suffers from inadequate sleep, if the doctor prescribes medicine, it should preferably be a short-acting agent like lorazepam or oxazepam, so that it does not cause drowsiness or sedation the next morning due to prolongation of effects. Similarly, an elderly patient requiring painkillers may be prescribed acetaminophen to its maximum recommended/tolerated dose with safer agents like ibuprofen or carefully observed selective cycloxygenase inhibitor (COX 2) inhibitors like celecoxib. In case of depression, agents like selective serotonin reuptake inhibitors (SSRIs) may be safer than tricyclic antidepressants (TCAs), especially amitryptilline. Similarly, for allergy treatment newer agents like cetirizine are safer than hydroxyzine, chlorpheniramine and diphenhydramine, which can cause sleepiness and urinary retention (in males). Many algorithms and criteria continue to be developed to decrease the harm from medicines in elderly patients, both in community as well as in those hospitalised. Some of these include “STOPP (Screening Tool of Older Persons’ Potentially Inappropriate Prescriptions) Criteria, which is a systems-defined medicine review tool, START criteria (Screening Tool to Alert Doctors to Right Treatment), NORGE criteria (Norwegian general practice criteria), PRISCUS list (Germany) and the French consensus list etc. Many studies on Indian patients for evaluating PIM using the Beers criteria have been done. The intention is to try to configure under what disease conditions, and with which medicines the safety of elderly patients is compromised with so that effective remedial steps may be taken at the earliest. The above-mentioned list is neither exhaustive nor is it meant to intimidate the elderly regarding the medicines being prescribed to them. The only purpose is to create awareness about this important fact to be kept in mind both by the prescribers and the patients so as minimise chances of inadvertent risks from medicines at this extreme age.